This morning, the group woke up at 5:45 to experience Haitian culture through a service at Church on the Rock. The morning service is open to all who wish to participate in praise and worship. This being said, when we all arrived and sat down, it was clear that we stood out among the normal participants. The morning walk home after the service was very beautiful and we saw the sun rise over the city. Breakfast at the compound was a little different than usual- Nora and Olivia helped the cooks to create a meatless meal, due to it being Friday in Lent. We all ate scrambled eggs, french toast, fruit, and juice. After the Livesay family came and spoke to us last night, we all were unsure what to expect at Mother Teresa's Home for the Sick and Dying. After an adventurous ride to the Home, we were happily surprised with a beautiful environment and warm smiling faces. The crowded city on the way to Mother Teresa's was quickly forgotten when we saw the peaceful atmosphere and light blue walls of the Home. The group split into the men's and women's floors and were greeted by the Sisters of Charity. We were asked to meet with patients who were very ill or dying and confined to their beds. Because of their conditions and the dry and dusty air of Port-au-Prince, the patients' skin often becomes extremely dry and painful, so we were asked to help put lotion on them. Walking into the rooms, the small groups were met by eager faces who were eager for our assistance. At first there was an air of awkwardness within the group as we spread out to each person, but the people put us at ease. Soon, intimate connections were formed through prayer and sense of loving touch. After assisting a young girl around our age, Molly Garin sat and prayed with her to comfort her through her struggle. Many of the men and women at the home have formed bonds with each other. In the men's quarters, one of the patients (who himself was in bad shape) comforted a dying man by using his only good arm to hold a small tape recorder to the man's ear so he could be comforted by his favorite Bob Marley songs. Despite the sadness that the home holds, the group left surprised by the comforting atmosphere created by the Sisters of Charity. The people within shared their peace with us all. This experience quickly became one of the most memorable of the trip. 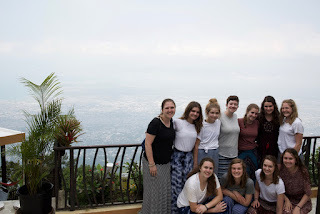 After being warned about the crazy Haitian traffic, the group decided to continue with the plan and drive up to the mountain market. In total, the drive there took about three hours (on bumpy Haitian roads with stifling heat). 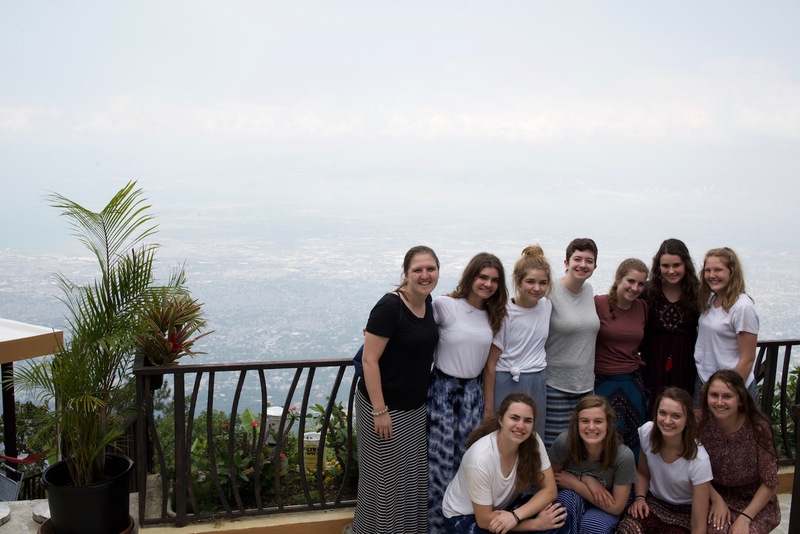 The cool mountain breeze at the top was a huge relief and we all enjoyed the view looking out over Haiti. As a whole, the group more or less learned how to barter, after being bombarded by the salesmen. A number of us purchased paintings, bracelets, wooden objects, and Mark even purchased a walking stick! When we arrived back at the compound, we ate a delicious meal of spaghetti and garlic bread for dinner. The night air was very pleasant and we all enjoyed nightly prayer together accompanied by Grace's life story- the mission director at Healing Haiti. One bonus to the night was the great amount of water pressure in the showers! We are all excited for beach day tomorrow.